Dan Shapiro says that Israeli Air Force airstrikes on Hezbollah likely stopped war, served an American interest. 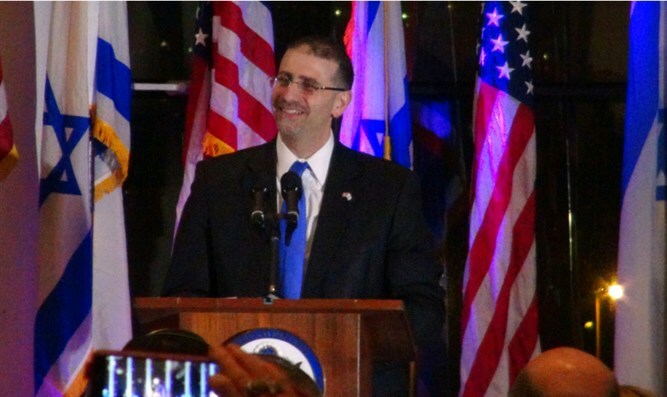 Former United States Ambassador to Israel Dan Shapiro praised Israel's clandestine bombings of advanced weapons shipments to Hezbollah, taking to Twitter Thursday to offer lengthy praise of Israel's longstanding policy of refusing to allow the militia to attain such weapons. Shapiro retweeted an article published by Haaretz, in which former Israeli Air Force (IAF) commander Amir Eshel told the newspaper that the Air Force had attacked the Shiite terror group almost 100 times since 2012, revealing for the first time the extensive nature of Israel's air strikes. "Such operations are fully justified and consistent with Israel's right and need to defend itself" Shapiro began. "Professionally conducted, they've produced few casualties and rarely any kind of escalatory retaliation. It's a credit to both the IAF and Prime Minister Netanyahu." Israel has been bombing Iranian weapons shipments to Hezbollah for years, fearing that advanced surface- to air missiles in the hands of the Iran-backed terror group would be a game changer. Shapiro said that the strikes served a long standing United States interest. "If war comes in Israel's north, it will be less destructive due to these operations. They have probably already helped prevent it. For that and other reasons, US interests are also served by these successful operations" he tweeted. "Given the timeline here, worth noting that under President Obama, the U.S. stood firmly behind Israel's right and ability to defend itself," Shapiro continued." We never wavered from that position, as I'm sure the current Administration maintains as well. It's a fundamental US interest in the Middle East." Current sentiments aside, the United States and Israel have not always seen eye to eye in regards to Israel's policy towards Hezbollah. In 2013, Israeli leaders were furious with their US counterparts after the United States leaked word of Israel's attacks in Latakiya and Damascus that targeted SA-8 missiles that were about to be transferred to Hezbollah in Lebanon. Former Israeli Ambassador to the United States Michael Oren had written in his memoir 'Ally' that the strikes alarmed the Americans, who feared that they would torpedo the ongoing nuclear talks the Obama administration was holding with Iran.